These homemade cheese sticks are great served as is or try them dipped in marinara sauce. Place cheese diagonally across the bottom of the egg roll wrapper. Roll wrapper over cheese, then fold ends in and continue rolling wrapper until the edge is folded under. 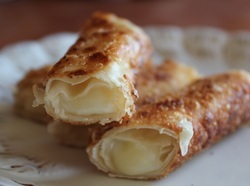 Fry cheese sticks in the hot oil turning until each side is golden, about 4-6 minutes.